The Bouvier des Flandres originates from Belgium. This is a large, sturdy breed weighing between 70-110 lbs. and standing up to 27 ½ inches tall. 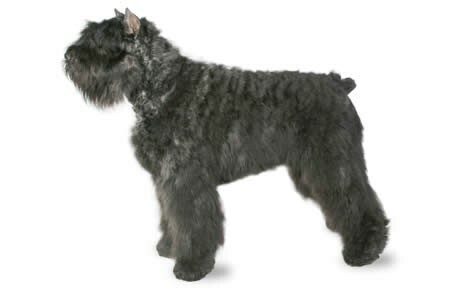 The Bouvier has a distinctive double coat that helps protect them in harsh environments and gives them a unique bearded appearance. Bouviers were originally bred to serve as an all-purpose farm dog. Their pedigree includes features from both sheepdogs and water dogs. Bouviers are the quintessential working dog. They are steady and resolute. Bouviers are a flexible breed that has been adapted to a variety of different working roles, including as a farm dog, therapy dog, cattle dog, guardian of livestock, and have served in both police and military forces. Bouviers are an intelligent breed that takes well to all types of dog training. Their historical use in a variety of different roles points to their adaptability and willingness to learn new tasks. Bouviers should be trained and socialized from a young age, and need a confident owner that can overcome their stubborn nature. Bouviers have a high exercise requirement that may not be for every owner. They are a hard-working breed that needs an outlet for all of that energy if they aren’t patrolling a flock or farm. It is recommended to give your Bouvier 3 to 4 half-hour sessions of exercise daily. Be careful not to overdo exercise during the puppy growth phase, as this can result in bone disorders. Bouviers live between 10-12 years. Bouviers are currently the 83rd most popular AKC registered breed. Bouviers are a large dog breed that has a high activity level, so they will need a good source of nutrition to keep up with their demands. Bouviers should be fed between 3 and 5 cups of high-quality food a day, split into two even meals so as to avoid gastric torsion. Consult with a veterinarian to find a suitable food source for a growing Bouvier, as a diet too high in protein can result in bone issues. Bouviers have fairly high grooming requirements. They need to be thoroughly brushed at least twice a week to minimize shedding and keep their coat healthy. They will also need their distinctive beard washed daily. Are Bouvier des Flandres Good With Kids? Bouviers are good with children as long as the children are taught to respect the size and power of this breed. Play with young children should be supervised. Hip dysplasia in dogs is a condition that commonly affects a number of dog breeds but appears with greater occurrence in larger dogs such as the Bouvier. Hip dysplasia is characterized by an improper fit between the femur and pelvis in the rear hip assembly. With this condition, the fit between these two critical bones is excessively loose. Over time, the laxity in this joint connection leads to uneven wear on the cartilage, resulting in painful arthritis, bone spurs, and eventually canine lameness. Hip dysplasia can be diagnosed from a young age during a physical examination by a veterinarian. Elbow dysplasia in dogs is a condition that commonly affects larger breeds. Similar to hip dysplasia, elbow dysplasia affects the connection between the radius and ulna in the front legs of the dog. The improper connection between these two bones causes the cartilage to wear unevenly. Unlike hip dysplasia, signs of elbow dysplasia can appear in young and juvenile dogs. Be mindful if your Bouvier displays any signs of lameness or limping following exercise, as these can be early signs of elbow dysplasia. SAS is a condition where the area below the aortic valve in the heart is too narrow. This condition is usually caused by the presence of fibrous band of tissue. SAS results in a buildup of pressure in the left ventricle of the heart. This condition is usually detected in puppies by the presence of a heart murmur. In older dogs, signs of SAS are fatigue, fainting, and intolerance of exercise. Glaucoma in dogs is a condition that is caused when a blockage in the eye creates a buildup of fluid. The buildup of fluid increases the pressure within the eye over time, often resulting in an enlarged eye. If left untreated, glaucoma can lead to damage to the retina and blindness.